((( JEREMY and REBECCA ))) Press :: Official website of singer-songwriter duo :: Debut album, What We Leave Behind, now available! When you head out Feb. 6 to hear the Tulare/Kings Counties Mass Choir annual concert, choir director Charles Parker says, expect a night of uplifting and entertaining music. "People tell me that they are really moved by the passion of the choir," said Parker, an English instructor at the College of the Sequoias and organizer of the event. Created 18 years ago, the Mass choir brings singing voices from College of the Sequoias and area churches to perform a gospel concert. The choir performs a mix of contemporary and traditional gospel music, Parker said. The choir has about 65 members, Parker said. Some also are members of the college group known as the BSTARS - an acronym for Black Students Taking Action to Reach Success. The organization promotes awareness of African culture. 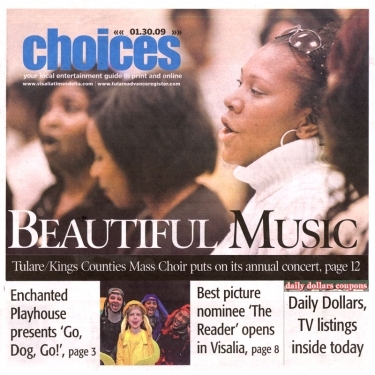 Tularean Wanda Katepa has been with the choir since its inception. "It's a chance to meet new people," Katepa said. "But the real thrill is singing to praise God." For this year's program, Katepa particularly likes "You Can Count on Him" and "You Have to encourage yourself," she said. Both songs will get your blood pumping," she said. Martha Sterling Stroman, also from Tulare, joined the choir this year - a decision she describes as working out "wonderfully." So why should people come out to the choir performance? 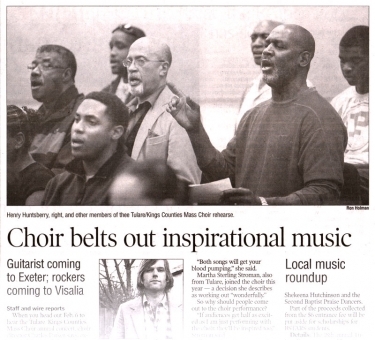 If audiences get half as excited as I am just performing with the choir, they'll be inspired too," Stroman said. This year's guest artists are Jeremy and Rebecca Hendrickson, a Visalia based singer-songwriter team that has recently released a CD. Hendrickson plans to perform three songs with the choir, including "What We Leave Behind," he said. Over the years, Hendrickson said, he has attended the choir's performances, which he described as a "blast." "What comes across most is the passion they all perform with," Hendrickson said. "It's a wonderful night of music." This year's concert also will feature special performances by Shekeena Hutchinson and the Second Baptist Praise Dancers. Part of the proceeds collected from the $6 entrance fee will be put aside for scholarships for BSTARS students. 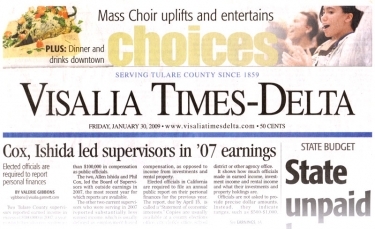 Details: The 18th annual Tulare/Kings Counties Mass Choir concert is at 7 p.m. Feb. 6 at the Visalia United Methodist Church, 5200 W. Caldwell Ave. Admission is $6 at the door. Information: Charles Parker, 303-4992.